The moving blue arrow points to your choices of Nightmares. Click on them for more info on the Nightmare you choose. 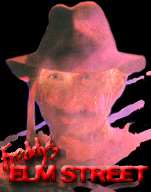 Welcome to Freddy's Elm Street. Everything on this website is categorized by movie. Click on the movie you want to go to at the top of this page. Things that don't go to just one movie will be found on this page in the list above.